To See our present situations, strengths and weaknesses in our health behaviour and Balanced and Healthy lifestyle. To increase our Encouragement to Cultivate our Motivation, Awareness and Skills to live our Balanced and Healthy lifestyle. What We will Get at the End of the Assessment? An explanation of your Balanced and Healthy lifestyle patterns or/and condition. Recommended action steps to Healthy harmonise and balance our present lifestyle and avoiding lifestyle more deterioration. Links to additional reading for increasing our Balanced and Healthy lifestyle Motivation, Awareness and Application. ♦ What’s Our Sleep Longevity Quotient? Holistic Health Assessment –The American Board of Integrative and Holistic Medicine (HolisticBoard.org) has been using a fantastic personal health assessment for many years now. It brings together emotional, physical, mental and spiritual health in an easy to use questionnaire. Let’s see how you and your patients do! Download and print the PDF. Lifestyle Assessment Tools by FortHealthCare.com – To stay healthy, you must fully understand your current health status as well as your risk of developing diseases in the future. The following health assessments give you personalized messages which can help you to improve and maintain a healthy lifestyle. ♦ Lifestyle: Career Burnout, Diet & Nutrition, Emotional Health, Fitness, Sleep Health, Stress & Anxiety, Work & Life Balance . ♦ Condition: Allergy, Cancer, Depression, Diabetes, Heart Attack, Menopause, Pain, Stroke . Lifestyle Assessment Tools by Centre of Excellence – In most cases some form of lifestyle assessment is necessary for identifying and prioritizing the behaviours that elevate risk, and the lifestyle factors/issues that should be considered in encouraging behaviour change. Lifestyle Assessment Tool for Healthy and FANTASTIC pregnancy– We know that the average pregnancy is 9 months long, but the 3 month period before conception is just as important. This is a time when men and women can look into their family history and make changes in lifestyle habits that can affect the conception and development of babies even before pregnancy takes place. Here is an assessment that will guide you through the 12 month pregnancy and ensure that you have a FANTASTIC lifestyle. 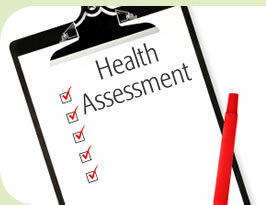 Take the Health Assessment – How’s your health? Learn where you stand and why it’s important for you to make healthy choices with this free health assessment. It should take about 15 minutes to complete and to get your results. Automated Health Assessment Tools – The MyTherapySession.com automated health assessment tools were created by Brent R. Coyle, MD, to help you define your health care needs. Through the use of these health assessment tools, you can assess your own needs for personal growth, as well as record, organize, review and update your most important medical details. At the conclusion of each health assessment, you will be given the opportunity to print and forward the results to your provider who can then assess the results to determine your most effective plan of treatment. How good is YOUR breathing? Take our Free Breathing Test and see! Our Personal Constitution Evaluation by Ayurvedia (Sanskrit:Prakriti). Are we Vata, Pitta or Kapha type? Recommended to read article “Beyond the Questionnaire: Using the Health Assessment as a tool for behaviour change“.